Dump Download / Zip-packed folder Number of Disks ? / ? In 1990 three hand held consoles were released. stereo sound and even a left handed mode. It rocked. System in a smaller box. Not very exciting. and 8x8 sprites looked weak in comparison with the opposition. And guess which one sold the most? their previous smash hit releases. inadvertedly came across documentation for a Nintendo Gameboy emulator. "Why don't we do this on the Falcon ?" to Atari screens two years earlier. almost ready, The public held their breath. MSG's palace, Bolton, May 1997. The finishing touches to "Bubble Bobble"
"BombJack" was completed. It was, in a very real sense, the bomb. 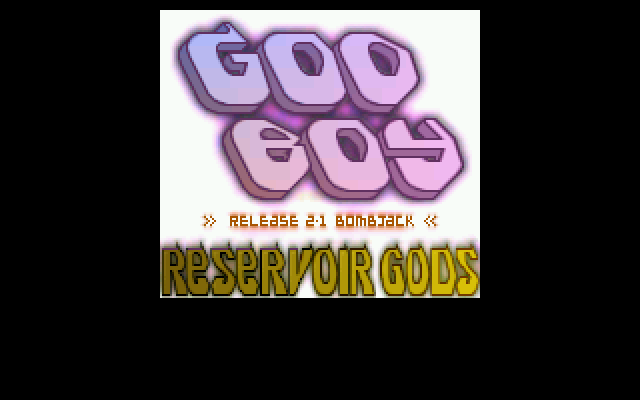 God-Boy is specially designed just to run the included game. You cannot load other gameboy files into God-Boy! nice trainer mode on the front end. GodBoy release will pop out onto the earth. Like a little lamb in spring. Use your mouse implement to click twice on "GOD_BOY.TOS". 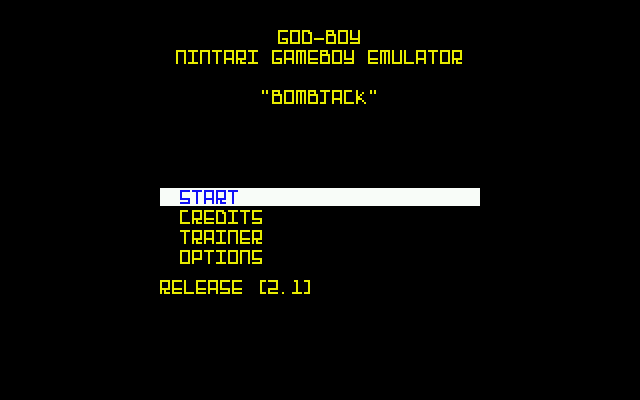 Make sure the file "BOMBJACK.GB" is in the same directory. Via the magic of GEM, the program will now load. the emulator. The menu is controlled with cursor keys and space. Begins the game. No, really. Prints up the usual guff. Allows you to cheat quite blatantly. This gives you a not inconsiderable number of lives. This prevents unwanted deaths from contacts with baddies. 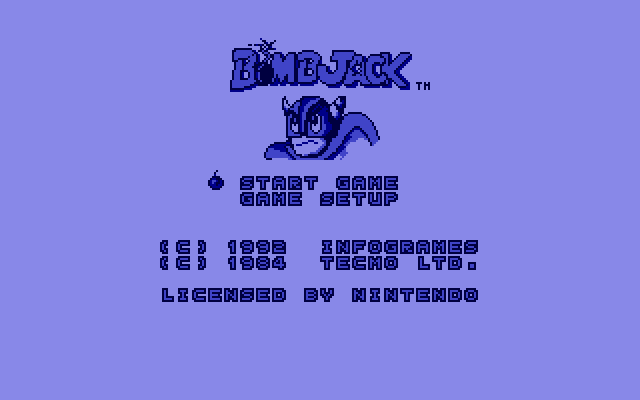 This allows BombJack to fly through platforms from underneath. He can still land on them from above as normal. Use left and right arrow keys to changed the level. stuff. You may also notice some small speed increase with the emulator. The Music and Sound Effects can also be toggled on and off. You may notice a small difference with your ears. If the DSP TRACKER is off, these options have no effect. Directions and Fire A as on the gameboy. you can control the bomb cursor with up and down. direction. If you are polite. to defy Newton's laws and fly from the ground. To do an extra big super jump, first press up then press button A. 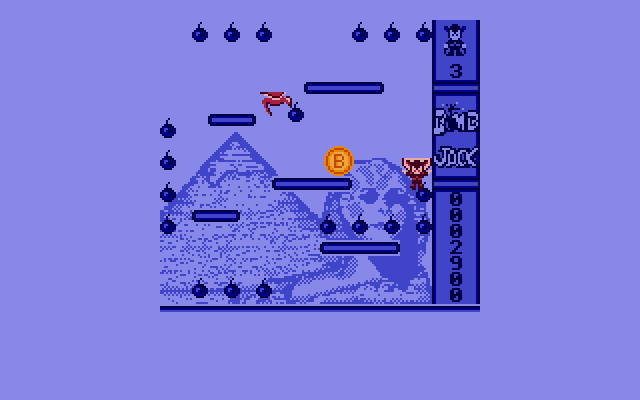 Collect all the bombs on a level to progress to the next one. It's just like pacman, but with gravity. And bombs. 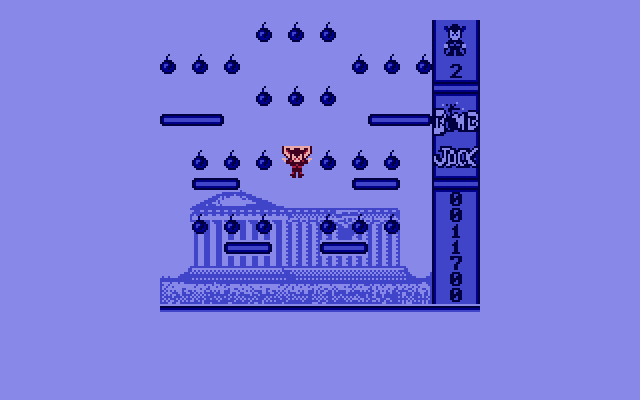 There is a special order to collect the bombs on each level. will get at the end of the level. is effectively now over. But is it? this chance to slip from your grasp and the time will run out. Press  again to return to the main menu. current directory under the filename "GBSCREEN.PI1". This is a standard 32034 byte degas file. We have created a full Gameboy debugger for God-Boy. memory in exactly the same way as MON-ST on the Atari. trainer modes etc. then drop us a line and we will send you Mon-GB. All code was written in 100% 68030 assembly language. STE only as the Blitter is used quite heavily. Marcel De Kogel, Marat Fayzullin, Jens. Tat - for moral support and the DSP replay. Flinny - for laughing at the early version of God-Boy. Absence. Aggression. Avena. Black Scorpion Software. Chaos Engine. Cream. Cobra. Dead Hackers Society. Escape. EKO. EXA. Fun. Impulse. Inter. Lazer. Maggie Team. Misfits. MJJ Productions. New Beat Development. Pandemonium. RDT. Scarface. Senior Dads. Shadows. Therapy. TNB. Tool 8. Toons. Toxic. We will be releasing more Gameboy games for God-Boy. There aren't going to be bunged out production line style like on the nasty PC. and stereo samples and good colours. to God-Boy, please get in touch. laugh long and hard at Nintendo as you blatantly rip them off. copies of the big issue, you know who to blame. We are now officially bonkers (2).